Tuesday 10th October is World Mental Health Day. So, we have created an assembly for schools to use with their pupils. 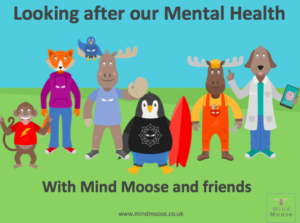 It introduces mental health in the context of being as important to look after as physical health before discussing ways that we can all look after our mental health. It also discusses how children and adults in a school community can help each other to look after mental health. You can download it by clicking the button below. Do let us know in the comments if you use it and how you get on! We love animals here at Mind Moose and so do most pupils. So this assembly uses a fun, pet theme to discuss how we talk to ourselves and the importance of treating ourselves well. This assembly has been created for World Mental Health Day, although you could use it at any time. It’s been written with KS2 or early KS3 pupils in mind, although you could adapt the content for any year group. There is a presentation for you to use in an assembly as well as a PDF plan. There is also a form time sheet and discussion. You can download everything below. Do let us know if you like them and feel free to share! Sign up for Moose Mail!